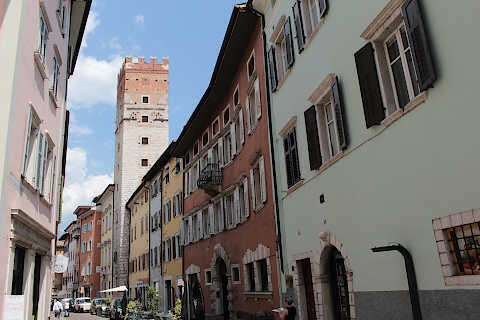 The historic town of Trento, towards the south of the Trentino-Alto Adige region between Bolzano and Verona, is the capital of the region and a town with over 100,000 inhabitants. 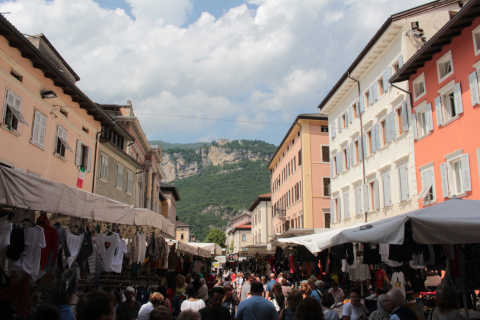 In a lovely setting surrounded by mountains, Trento is a glamorous, attractive city with a great deal to explore both within its important buildings, and within the narrow streets that surround the centre. 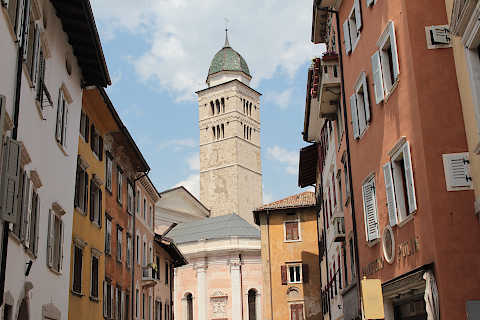 It is also very much a bustling Italian town, not too given over to tourism. 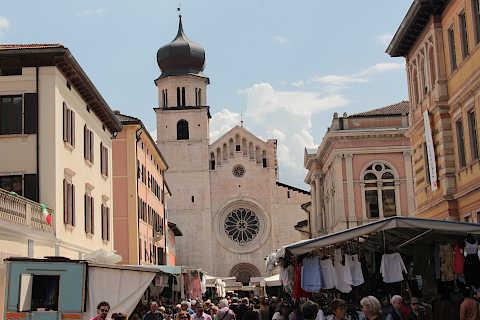 Start your visit in the Piazza del Duomo, an attractive square in the centre of Trento and the heart of the historic city. 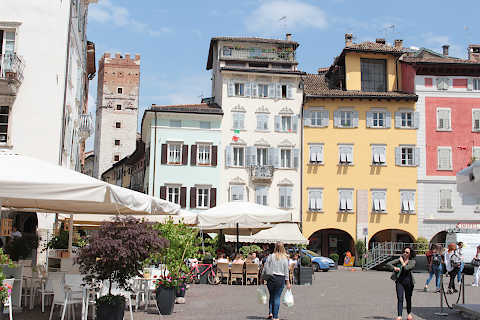 This is a very lovely square with charming buildings on all sides, beyond which you can see the mountains. 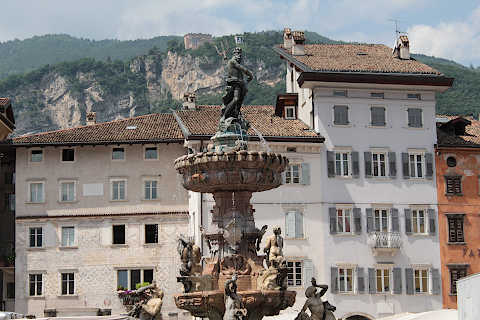 In the centre of the Piazza del Duomo you can see the impressive Fountain of Neptune. 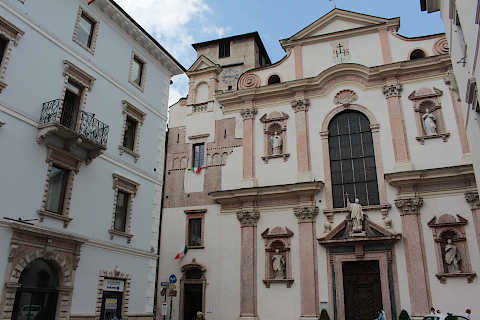 One side of this square is dominated by the 13th century Cathedral of Saint Vigil (the duomo). 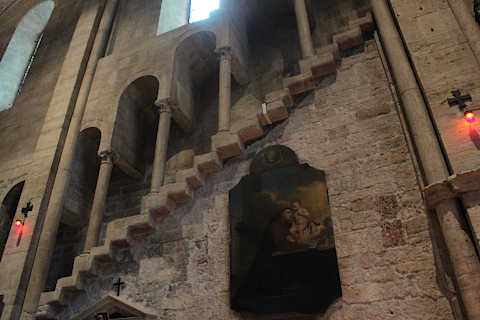 The cathedral was never completed, as you can see when you look at the main facade - only one tower has been built - but all the same it is a very elegant building, in the romanesque style of architecture. 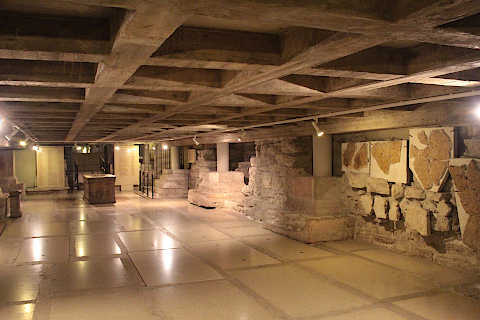 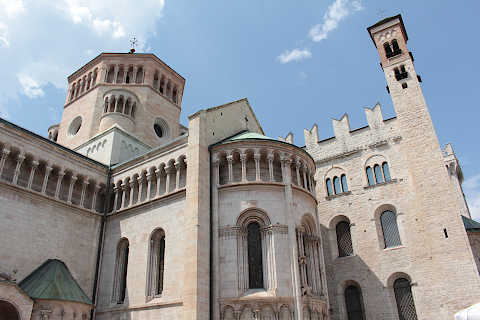 Inside the cathedral you can access the original christian basilica that stood on this site: see Trento cathedral for information. 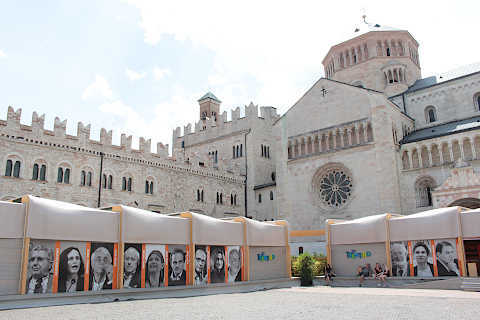 On the same side of the square you can see the Palazzo Pretoria, the palace where the bishops lived until the 13th century and now home to the Diocesano Tridentino Museum. 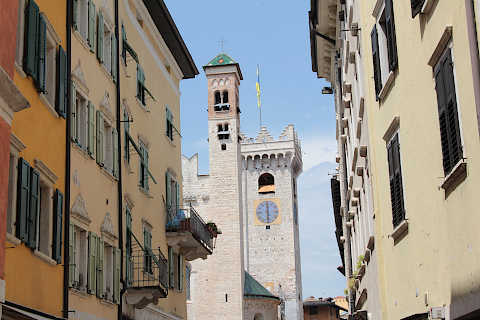 The palace is next to the most famous tower in the town, the Torre Civica. 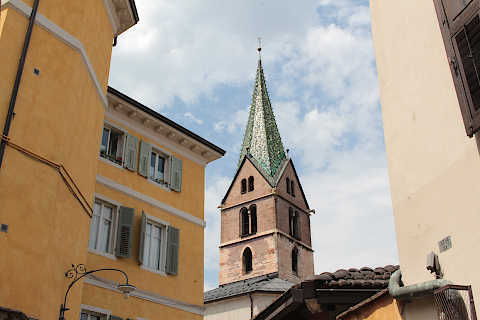 This tower dates in part from the 11th century and stands on top of one of the original Roman gates into the town - this can be seen in the archaeological area beneath the tower. 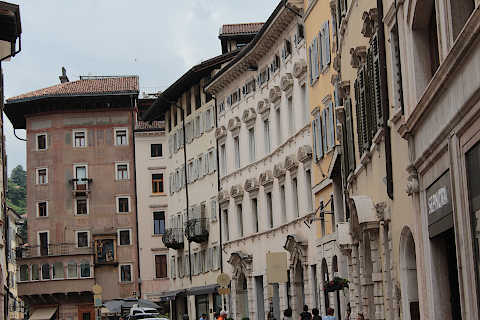 Many of the buildings around the edges still feature their original arcades at ground level. 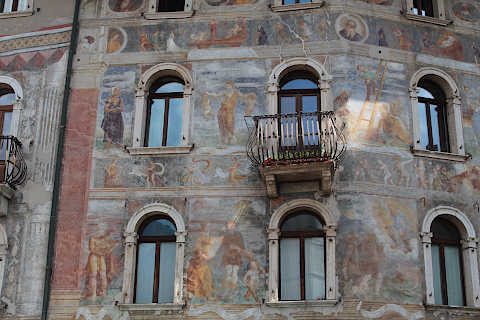 Take a look at the frescoes on the house at the southern end of Via Rodolfo Belenzani, among others. 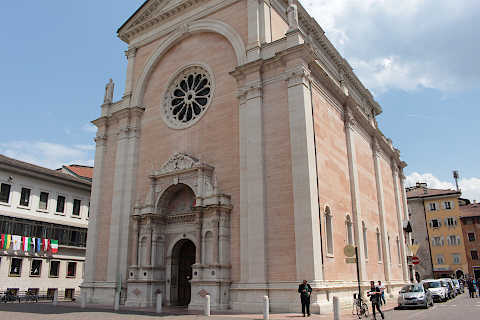 From here you can continue to explore the historical center of Trento which largely to the north of the Cathedral and includes Via Rodolfo Belenzani to the east and Via Giannantonio Manci then Via San Marco to the north. 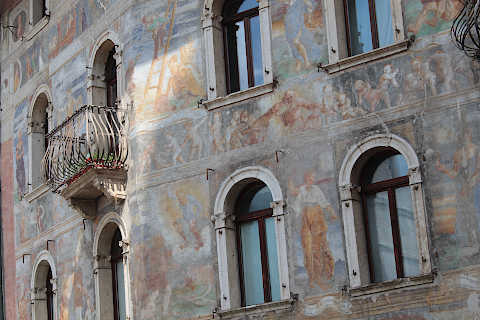 There are numerous attractive medieval mansions and villas (often called 'Palazzi' - small palaces), some of them covered with frescoes, in the surrounding streets and boulevards. 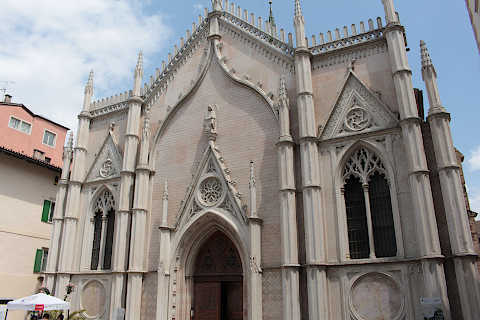 There is little point in our giving details of every palace here, but when you visit you will see that each monument in the town has a detailed information panel in English, Italian and German. 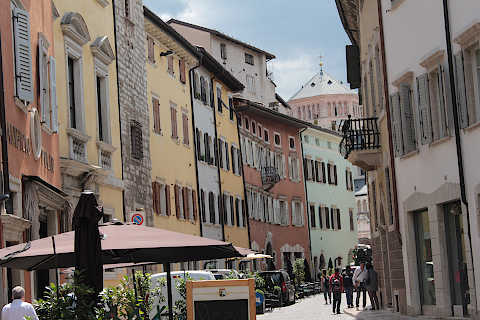 If you continue north from the eastern end of Via Giannantonio Manci you can see more pastel coloured houses with intact medieval arcades on the Via del Suffragio. 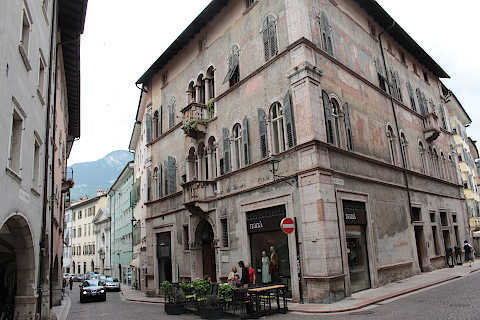 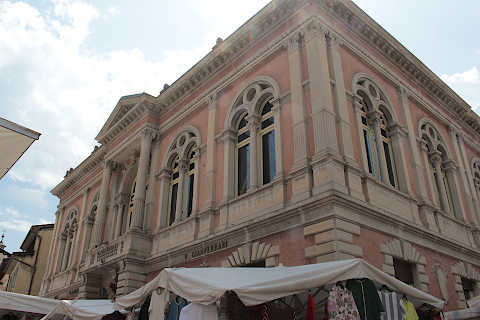 In fact, the whole historic centre of Trento contins a quite remarkable number of beautiful houses and small palaces. 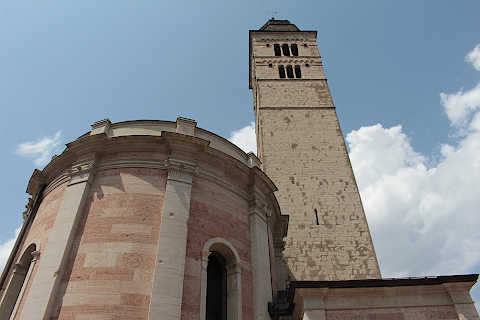 At the north end of Via Cavour you will see another religious monument that is important in Trento, the Church of Santa Maria Maggiore. 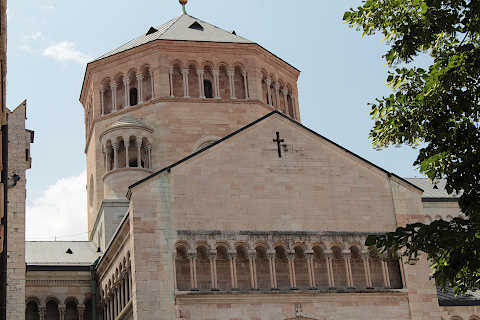 This church was built in the 16th century and is best known for its tall and elegant belltower. 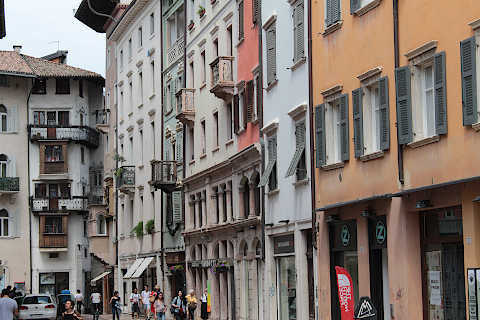 The largely pedestrianised area surrounded by these streets is very pleasant to explore with a good number of shops and restaurants. 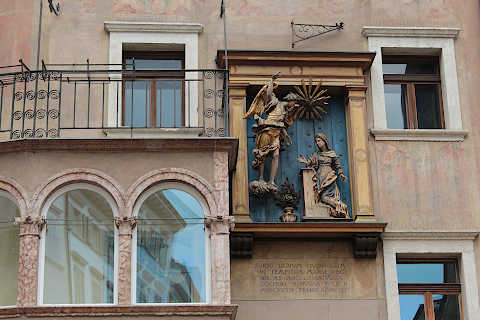 Just outside the historic centre to the east, at the eastern end of Via San Marco, you will discover another highlight of a visit to Trento. 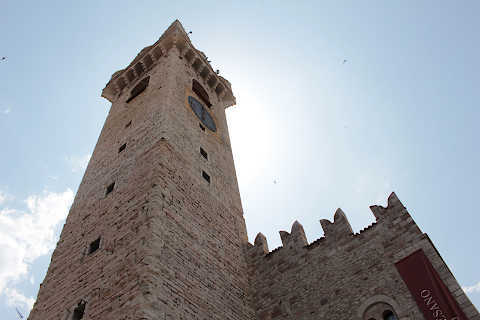 This is the Castello del Buonconsiglioa castle, that dates from the 13th century, although substantial later additions have transformed the original structure. 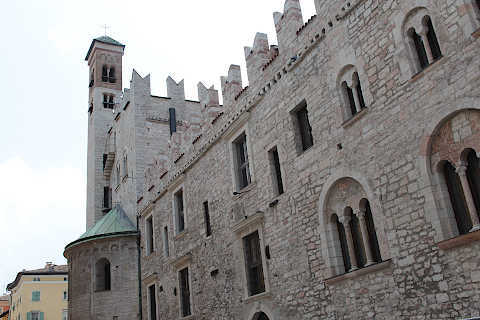 Within the castle is the luxurious interior of the Magna Palazzo, an impressive palace within the castle. 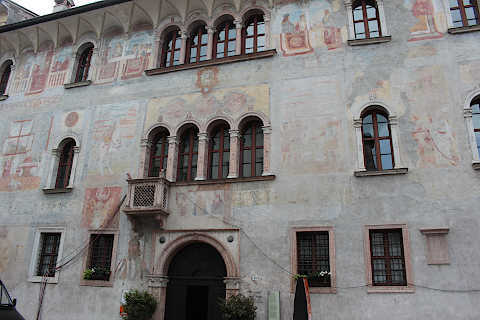 The 16th century palace is best known for the numerous frescoes it contains, decorating the walls and ceilings, many of which relate stories from classical literature. 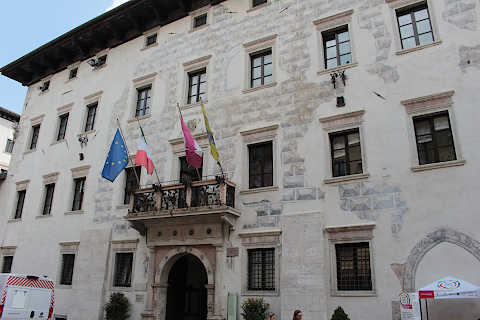 An important part of the castle is now used as the 'Museum of Buonconsiglio Castle', with sections dedicated to archaeology and various periods of Italian art history. 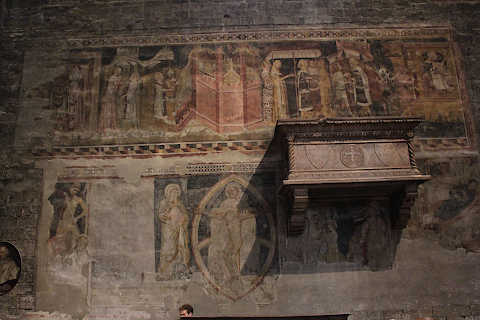 See Castello di Buonconsiglio for details. 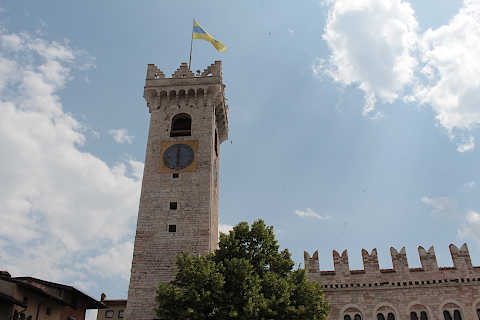 The region around the town is very scenic and invites exploration, and includes Monte Bedone, the mountain clearly visible from the town, and the Parco Naturale Adamello-Brenta. 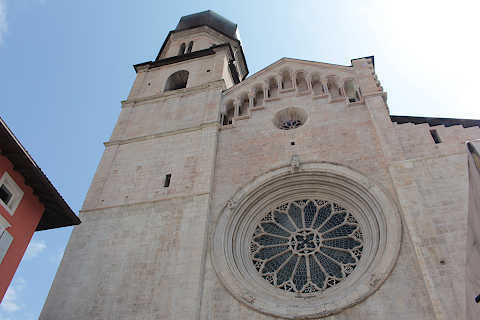 During the winter months Trento is close enough to the mountains to allow access to several ski areas. 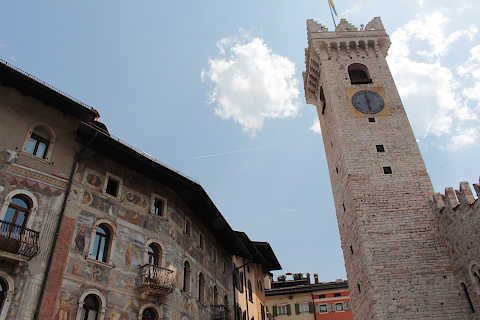 To the north of Trento in the dolomites, the Val di Funes is a very lovely valley with some of the most impressive scenery in Italy. 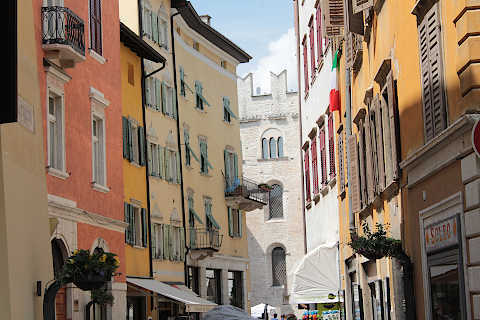 Not far south of Trento you can visit Lake Garda, one of the most beautiful of the Italian lakes and with many small towns and resorts to explore.